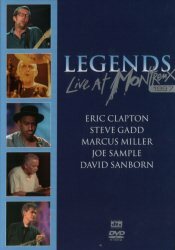 Legends is a unique concert from the Montreux Jazz Festival bringing together the formidable talents of five musical superstars : Eric Clapton (guitar and vocals), Steve Gadd (drums), Marcus Miller (bass), Joe Sample (piano) and David Sanborn (saxophone). Together they produce an intoxicating blend of jazz and blues on classic tracks such as "Full House", "Shreveport Stomp", "Groovin' " and an outstanding acoustic version of "Layla". What a night! Why did it take so long to release this concert? I am a fan of each musician on that stage and couldn't wait to get home and watch them play. I agree with Ulf, they played a perfect set and it's a pity the guitar sound is poor on one track but it's ok. The most exciting thing for me was to see Clapton play with a jazz group , he is my favorite musician and I knew he would deliver something extraordinary. I hope they will find the time to do it again, it would be great to watch them live. "All the time that I knew I could play blues, I was still very insecure about my standing as a legitimate musician. I didn't feel I could sit and have a conversation with a jazz player about music because they were on a higher level than me. Yet I've found over the last few years that I can approach any kind of music and bring a unique point of view to it. For example, when I toured with the Legends band, I thought I wasn't worthy to play with them. But even though I felt I wasn't in their league, when we talked about music, I realised, "Hey, I do know enough to stand alongside these guys and play" ". I understand Clapton's respectful attitude, although being, as stated in the DVD-sleeve, "the world's most famous living guitarist". I really agree to his statement above, "I can approach any kind of music and bring a unique point of view to it". If you e.g. listen to "Concert for George", especially when he plays the special Ravi Shankar composition for George, you'll see what I mean. However, I still think it is pity that he used the same tone from his Stratocaster as he too often uses, I would have preferred a more mellow tone. Unfortunately one tune is badly mixed, Clapton's acoustic guitar is hardly audible, I guess the electric connection to the guitar was out of order. Funnily enough the sleeve text says "Here, Clapton's signature Martin acoustic underpins lead lines from Marcus Miller's just-donned six-string bass." The tune is "In case you hadn't noticed". However, when I watched an excerpt from the some of the concerts on TV many years ago, which I have on a video, the mixing is fine. By the way, the tune was called "Suggestions" on TV. I really like the mix of tunes, from a soft "In sentimental mood" to a vivid "Full House". As I consider the live concert in 1997 as some of my most memorable concert ever, I may overrate it somewhat. So finally, after eight years delay, I really enjoy this DVD!